Metal-on-metal was the first articular couple to be successfully used in total hip replacement. Large heads and high frictional torque resulted in a high incidence of implant loosening. This led Charnley to introduce the low friction arthroplasty where the torque was reduced by using small heads and low friction hard-on-soft bearings. Osteoarthritis is a disease of cartilage, and resurfacing arthroplasty is therefore intuitively the logical conservative surgical solution. The early resurfacing devices with metal-on-plastic bearings were associated with catastrophic wear of the plastic. In the 1990s resurfacing was revisited, and metal-on-metal was selected to resolve the challenge of the bearing surface. Various factors were not initially recognised as being critical for the successful outcome of these implants. 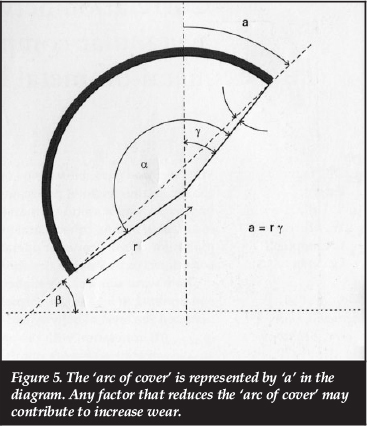 These include the importance of component orientation, the significance of an adequate 'arc of cover', the prevalence of edge loading, and the impact of microseparation. In addition the biological response - pseudotumour/ALVAL etc. - was unpredicted and unexpected. Femoral neck fractures in patients with a resurfacing arthroplasty were treated by revision to a stemmed implant with a large head. However this option was seen to have a wider application than resurfacing, was perceived as a 'high performance bearing' and addressed the problem of dislocation - one of the commonest causes of revision. These large bearings provided a dislocation 'safety net' to surgeons, many of whom consequently became less meticulous about component orientation. Liberation of metallic debris by fretting and corrosion at the taper junction between the large head and the taper of the stem - totally unforeseen by the bioengineers - emerged as a real problem in these hips. This paper attempts to scientifically place some of these issues in perspective against the backdrop of hysteria created by legal colleagues and the media. Keywords: hip, large metal bearings, failure. Metal-on-metal (MoM) was the bearing of choice in the early 1960s, using a monobloc stem with a large head. These prostheses (McKee-Farrar, Huggler, Müller etc.) were made of cobalt-chromium molybdenum alloy, and exhibited a very low wear, even up to 20 years after implantation.1 Poor component design - low head neck offset, poor prosthetic fixation, etc. - often led to early failure. 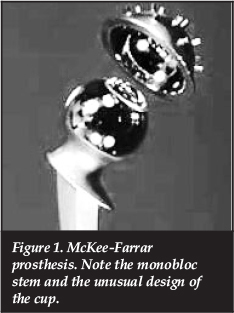 However Brown et at.2 reported an 84% survivorship of the McKee-Farrar (Figure 1) at 20-year follow-up, while Jacobsson et at.3 noted that the long-term results of the McKee-Farrar were comparable to those of the Charnley low friction arthroplasty. The high early incidence of loosening of these early large bore MoM articulations was attributed to increased shear stresses at the fixation interface consequent upon the high friction at the bearing interface. This led to Charnley introducing low friction hard-on-soft bearings - metal on ultra-high molecular weight polyethylene. This paper attempts to scientifically place some issues in perspective against the backdrop of hysteria created by legal colleagues and the media. The recognised limitations of high density polyethylene resulted in the development of alternative bearings -highly cross-linked polyethylene, metal-on-metal and ceramic-on- metal. MoM bearings do not fracture, are self-healing, generate very low volumetric wear, and can be used for large bore couples. MoM therefore met the requirements for resurfacing, namely, the use of thin components to avoid undue resection of the femoral head and acetabulum, the use of large heads, and the use of materials with an established record in clinical practice. Resurfacing arthroplasty (RA) gained substantial traction at the turn of the century and increasing patient and surgeon demand dictated that virtually all orthopaedic companies included a resurfacing device in their portfolio. Femoral neck fractures occur in up to 1.5% of RAs, and are the commonest cause of early failure of these devices. In these circumstances it is only necessary to revise the femoral component. All companies therefore manufactured a range of modular large diameter metal heads that would articulate with the monolithic resurfacing cups and could be applied to stemmed femoral implants. 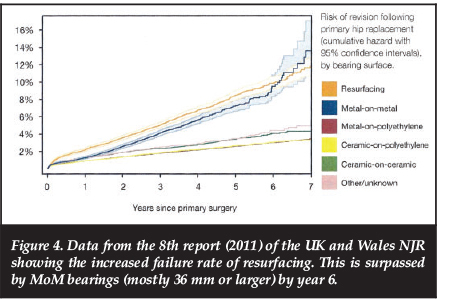 Hip registries identified dislocation as the commonest cause of early revision and the second commonest cause of revision. Large bore MoM bearings seemed like a panacea: a 'high performance bearing' with virtually no risk of dislocation, no risk of fracture and very low wear. Arthritis of the hip primarily involves the articular surfaces and subchondral bone of the joint. Intuitively therefore resurfacing of the joint is the logical conservative surgical option. It should be recognised at the outset that some resurfacing prostheses have performed remarkably well in selected patients. McMinn et at.11 reported a 99% and 98% survivorship of the BHR at 10 and 15 years respectively in male patients with osteoarthritis. Coulter et at.12 reported a 97.5% survivorship of the BHR in males at a mean follow-up of 10.4 years. The survivorship in females was only 89.1%. 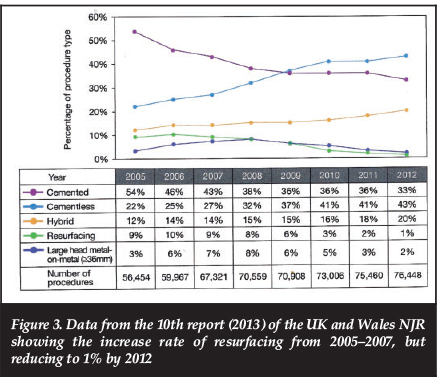 The aggressive promotion of the early success of RA resulted in an increased demand for resurfacing around 2005-2007 (Figure 3). However an unexpectedly high failure and revision rate (Figure 4) resulted in a marked decrease in resurfacing activity over the past few years (Figure 3). Factors contributing to the failure of RA devices include poor patient selection - rheumatoid arthritis, osteoporosis, avascular necrosis, etc. - which was often associated with an increased incidence of femoral neck fracture. 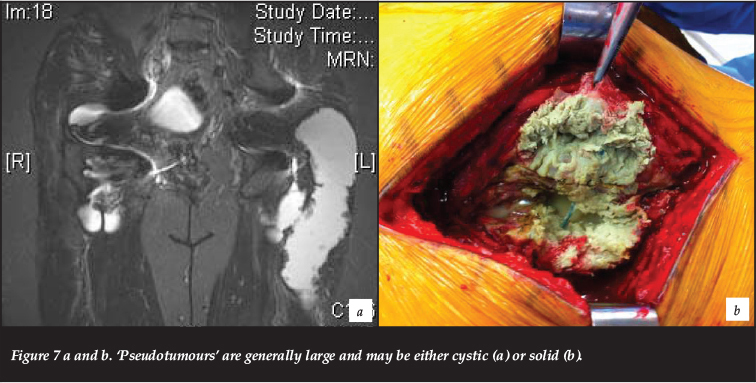 Loosening of the acetabular component is one of the commonest causes of failure of large bore MoM implants. One of the main contributory factors is the significant torque generated by the high frictional resistance encountered at the articular interface of these bearings in the absence of a favourable lubrication regimen13 - for example, when rising from a sitting position, edge loading, etc. It should be noted that edge loading will itself markedly increase torque on the cup. 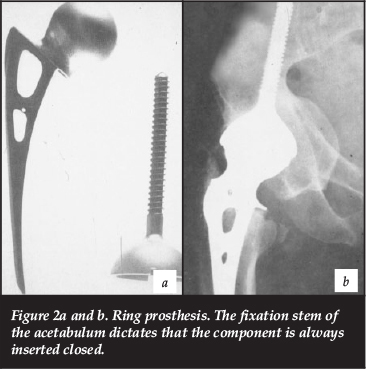 In addition acetabular implants with a low clearance and a thin shell - designed to limit bone resection - were susceptible to deformation and equatorial binding when inserted into hard sclerotic bone. This produced enormous shear forces at the fixation interface which often culminated in loosening of the cup. Developmental dysplasia of the hip: The morphology of the acetabulum dictates that the cup is often inserted too 'open'. 2. Rim or edge loading can occur where the cup is malorientated - either too vertical or with excessive ante or retroversion. Morlock et al.14have shown that rim-loaded implants exhibited an average 21- to 27fold higher wear rate than implants without rim loading. In addition, rim-loaded implants showed a steeper mean cup inclination than their non-rimloaded counterparts (59° vs 50°). It should be remembered that the articular relationship between the femoral head and the acetabular component is affected by the orientation of both components. The orientation of the femoral components is seldom considered in the literature - even though a markedly valgus or retroverted head will provoke edge loading. 3. Microseparation is a potent cause of increased wear. Leslie et al.15 noted that bearings tested with a cup inclination of 60° had nine-fold higher wear rates than bearings tested with a cup inclination of 45°. However, if the increased cup angle was combined with microseparation, wear rates increased by 17-fold compared to the standard. Microseparation provokes edge loading and can occur following RA where poor bone quality or avascular bone dictates that more bone than usual is moved from the pole of the head. As resurfacing does not readily allow for the adjustment of length, microseparation may occur at the articular interface. Collagen deficiency and joint laxity - as for example encountered with Ehlers Danlos syndrome - can also result in microseparation. Microseparation can therefore be the cause of increased metal wear even where the implants appear radiologically perfectly orientated. The genesis of XL-THR has been described above. The concept of a high performance bearing with virtually no risk of dislocation proved very attractive to surgeons, and the use of XL-THR rapidly surpassed that of RA. However, unexpectedly the failure and revision rate of these implants exceeded those of RA.16 Garbuz et al. reported that the blood metal ion levels were approximately ten-fold higher with the XL-THR than in a matched cohort of RA. Long et al.17 reviewed 181 XL-THR at mean follow-up of 1-2 years, and noted that 15% had been revised while 14% had clinical and/or radiological signs of impending failure. XL-THR is susceptible to the same issues at the MoM articular interface as RA. However, all total hip replacements with large MoM bearings are also susceptible to fretting and corrosion at the head/taper junction. This is associated with the liberation of metallic debris and a significant incidence of Adverse Reaction to Metallic Debris (ARMD). 1. A contaminated taper (blood/fat etc. ): It is essential with any modular head to meticulously clean and dry the taper before application of the head. 2. The head is not sufficiently firmly impacted to fully engage the taper. 3. The head is not applied axially in line with the taper. This can prevent full seating of the head, consequently provoking early micromotion with fretting and corrosion. 4. Cone angles have been reduced and trunnions have been made shorter with resultant increased localised stresses. 5. Most of these large 'endoheads' are applied onto a sleeve which is fitted to the taper. Some of these sleeves are titanium, and the titanium/titanium junction in this setting is associated with significant fretting and corrosion. 6. Larger heads are associated with an increased 'arc of cover' and reduced wear in RA. However, the larger the head in an XL-THR, the greater the head taper offset (Figure 6).18 This results in increased torque and bending moments at the taper, with a consequent increased risk of fretting and associated corrosion. High body weights and activities are associated with higher loads, which could increase the risk of fretting-induced implant failure in the clinical setting. 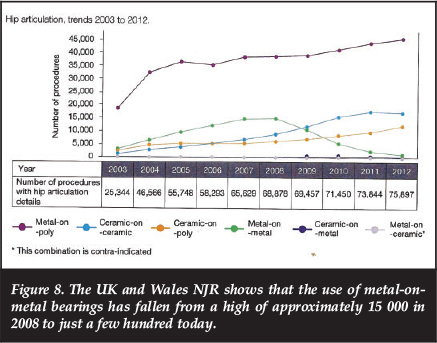 It was probably the unexpectedly high failure rate of these THRs with large bore MoM bearings (>36 mm) which induced Smith et al.19 to comment that 'Metal-on-metal stemmed implants give poor implant survival compared to other options and should not be implanted'. It should be recognised that metal ions are released from any metal implanted in the body. These can be widely distributed throughout the body even with a metal-on-polyethylene bearing.20 Well-functioning metal-on-metal bearings have very low volumetric wear, but generate a very large number of tiny nanometre particles. MoM bearings functioning in adverse conditions are associated with increased volumetric wear, and the generation of larger particles. The uptake of particles smaller than 150 nm is mediated by the cell membrane through endocytosis and pinocytosis.21 Particles larger than 150 nm can stimulate phagocytosis by specialised cells such as macrophages.22 Particle size will therefore influence the genesis of the biological response. Co and Cr ions may cause mutagenicity (DNA damage, aneuploidy), allergy, type four T-cell mediated hypersensitivity (aseptic lymphocyte-dominated vasculitis-associated lesion or ALVAL), toxicity (cell death) and a cyto-chemical response (chronic inflammatory/granulomatous). The biological response to metallic debris is influenced both by the volume of debris and the morphology of the particles. Daley et at.23 showed that wear debris damaged chromosomes in a dose-dependent manner. However, after reviewing the evidence, the MHRA (Medicines and Health Regulatory Agency - UK) concluded that there was no evidence that elevated levels of Co and Cr were associated with clinical effects. Nevertheless, given the long-term latent period to the expression of small particle disease, Learmonth and Case24 have noted that 'there is no room for complacency'. 'Pseudotumours' in association with MoM resurfacing were first reported by Pandit et at. in 200825 in three different resurfacing devices. These lesions can be cystic or solid, and can be very large, invading the periprosthetic soft tissues (Figures 7a and b). These patients typically present with pain and a local or regional swelling, but may also exhibit a neuropathy, instability, etc. Pseudotumours' are typically characterised histologically by extensive necrosis, although there may also be heavy infiltrates of lymphocytes. These lesions are usually dose-dependent, although they can occur in asymptomatic patients, and in patients with normal levels of metal ions. Non-dose-dependent biological reactions to metallic debris include allergies and ALVAL (aseptic lymphocyte-dominated vasculitis-associated lesion). Allergies associated with metal implants are well documented in the literature, but are relatively rare. They may be elicited by nickel, cobalt and chromium -constituents of all RA and XL-THR bearings. These patients often present with widespread rashes on the trunk and limbs, which quickly resolve when the implants are exchanged for titanium alloy implants combined with a ceramic/ceramic or ceramic/polyethylene articulation. ALVAL was reported by Willert et at26 in 2005 in a series of patients with 28 mm MoM heads. The patients presented clinically with pain around the hip and signs of synovitis and an effusion. It is typically associated with low wear, and the diagnosis confirmed histologically with perivascular lymphocytic cuffs together with plasma cells and macrophages that contain metal particles. Davies et at27reported similar findings and suggested that this was some form of immunological response that could represent a novel biological mechanism that could lead to early failure of MoM devices. ALVAL appears to be an idiosyncratic delayed T-cell type four hypersensitivity reaction, which seems to occur relatively rarely. A metal-on-metal bearing produces very low wear, is 'self-healing' and does not fracture. So what went wrong? Randelli et at.28 have reported a 95% survivorship of 28 mm Metasul MoM bearings at 15-year follow-up. A huge number (>100 000) of these bearings have been inserted without reports of Adverse Reaction to Metallic Debris (ARMD) - except for the occasional case of ALVAL. Histological patterns similar to ALVAL were noted in the periprosthetic tissue around a small number of McKee-Farrar prostheses.29 These were probably the well-functioning bearings. Conditions of high wear (edge loading etc.) were usually associated with high frictional torque, and the fixation of the McKee-Farrar implants was not adequate to prevent early loosening and failure. The periprosthetic soft tissues were therefore seldom presented with a significant volume of debris consisting of larger particles of metal. The design features of MoM resurfacing components that contributed to an increased vulnerability to wear have been alluded to above. However it should be recognised that all large bore MoM bearings are less forgiving of technical errors. In addition resurfacing arthroplasty is a technically challenging procedure. It is therefore of interest that the implant that was released with a 'no train no use' policy has the best results in the national registries! Most resurfacing devices were extensively tested in simulators in the laboratory. However these regimens did not test true activity of daily living cycles, nor did they test performance under adverse conditions. This has been acknowledged by Fisher et al.30 and new testing protocols have been modified to address these issues. However, the orthopaedic community should by now have learnt of the danger of exporting concepts generated from simulators in the rarefied environment of the laboratory to the highly complex biological system that is the human body. It should be mandatory that there is a critical objective assessment of short- and mid-term clinical outcomes before any new implant is released to the wider patient community. Hart et al.31 have noted that edge loading was the most important predictor of wear rate, but the majority of retrieved implants did not have excessive edge loading. Microseparation can of course provoke edge loading in well-orientated implants. Vossinakis et al.32 observed that the inclination of the sourcil was a good predictor as to whether a patient would develop supero-lateral arthritis or medial pole arthritis of the hip. This was a function of the joint kinematics and the resultant vectoral force. A more lateral vectoral force could provoke functional edge loading, and conversely a more vertically orientated cup could be protected from edge loading by a more medially orientated vector. 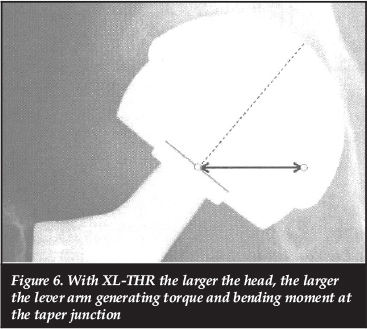 The XL-THR was developed to address the problem of femoral neck fracture in RA. This allowed only the femoral component to be revised. The incidence of dislocation following conventional THR was reported as 2-3%, and dislocation was identified as the commonest cause of early revision. It appeared that the XL heads (>36 mm) addressed the problem of dislocation, and the technology was enthusiastically embraced by surgeons. The XL bearings were regarded as a 'safety net' against dislocation, and meticulous attention to component placement was neglected - and this with a device that was less forgiving of imperfect technique! Charnley33 reported an incidence of dislocation of 0.4% using a 22.2 mm head, and felt that even this incidence could be reduced or eliminated by the use of a neck length jig. These outstanding results are attributable to a meticulous and reproducible technique. Companies should not be designing implants to address the technical inadequacies of the surgeon - the focus should be on appropriate instrumentation, technique and training. No one anticipated the problem of micromotion and instability at the cone taper junction producing fretting and corrosion. Retrospectively I believe it is fair to say that the implications of the reduction in taper size together with the increased torque and bending moments produced by large heads should at least have been considered by our engineering colleagues. The problem has dramatically declared itself clinically, and I fear the reactive research activity is now too little and too late. Langton et al.31 introduced the term ARMD. It is nonspecific and encourages clinicians not to distinguish between the discrete aetiopathogenetic entities that constitute the biological reactions to metallic debris. The biological response to metallic debris is still poorly understood. The diagnostic entities of 'pseudotumour' and ALVAL have not been clearly defined. Confusion and inconsistencies exist between clinician, radiologist and histopathologist. In some cases there may well be an overlap of diagnostic features. Some findings may be incidental and of no consequence. It has been suggested that ARMD lesions may occur in up to 50% of patients with large bore MoM bearings. Indeed an incidence of 28% at 5 years has been reported with the BHR,35 the best performing RA. Many of these 'lesions' may prove to be normal incidental findings, and more severe lesions only occur in approximately 5% of cases. Jacobs et al.36 has noted that the biological implications of elevated metal levels in the blood and urine remain the most significant concern about MoM couples. However there is currently no established toxicity threshold for the degradation products of cobalt alloy implants. MoM bearings have been successfully used in clinical practice. Today the adverse biological reaction to metal debris, the media attention and associated 'hysteria' have resulted in their use being largely abandoned (Figure 8). At present this is appropriate. However, we should recognise that it is not just the metal-on-metal bearing that is culpable: the manufacturing companies, our bioengineering colleagues and we, the orthopaedic community, are jointly and severally responsible. The author is a consultant for De Puy, but no benefits of any form have been or will be received from a commercial party related directly or indirectly to the subject of the article.